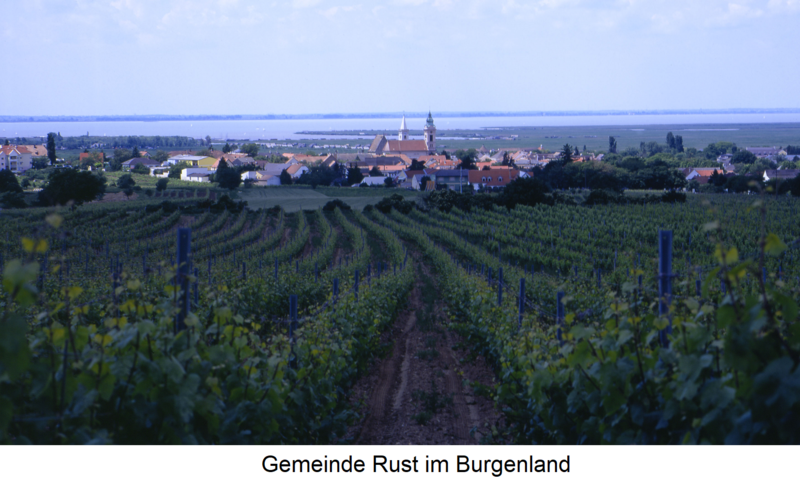 The wine-growing community in the Austrian state Burgenland lies on the west bank of Lake Neusiedl close to the border Hungary, It is considered the "secret wine capital of Austria". With 1,700 inhabitants, Rust (which is also called "city of storks" due to the animals that are common here) is the smallest town in Austria with its own municipal law. The area was first mentioned in 1317 on the occasion of a deed of donation of the Hungarian King Charles Robert I of Anjou-Naples (1278-1343) for his follower Desiderius Hedevary as "possessio Ceel vocatum circa stagnum Ferthew" and in 1385 as "Rusth" ( Hungarian Szil = elm, Rüster). In 1479, the "Zech" (guild of winegrowers) and the confirmation of the special wine export privileges by the Hungarian king Matthias Corvinus (1440-1490). The Hungarian Queen Maria (1505-1558) granted Burgenland winegrowers great privileges. In 1524, the Ruster received their own trademark protection mark "R" with letter and seal, which was previously branded on all wine barrels. This was Maria's thanks to the place, because according to legend, she was rescued by a Ruster wine growers, as they came on the Neusiedlersee in a boat trip by a storm in distress. Even today, the "R" is included on most bottle corks. In 1681, the citizens of Rust bought from Emperor Leopold I (1640-1705) the increase as "Freistadt" by 60,000 guilders and 500 buckets of noble sweet white wine Ruster outbreak, This was not a bribe, but usual practice. Already at that time Ruster Wein was exported to Bohemia, Moravia, Silesia and Poland. The ruler Maria Theresa (1717-1780) estimated next to the Hungarian Tokaj also the Ruster wine and was here in 1760 as a guest. After the First World War came in 1921 Burgenland and thus Rust to Austria. This page was last modified at 30 January 2019 at 13:20.